Click On The Balls For A Closer Look. I'm Steve Ramer. I've been playing baseball in the MSBL for the the Lehigh Valley League Dodgers for 15 seasons. I'm also an artist. 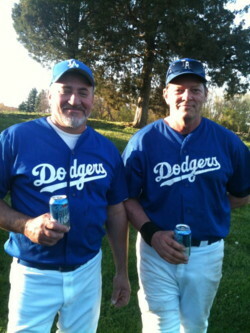 That's me on the right enjoying an adult beverage after a game. 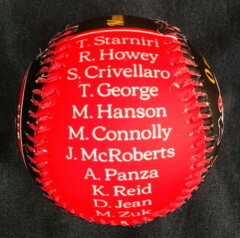 I've created my Baseball Treasures MSBL Baseballs especially for those of us who enjoy the MSBL so much every summer. 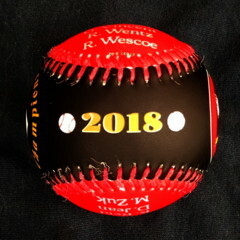 If your team won the Championship in your division/age group or just had a great season, my MSBL Baseball Treasures make a great keepsake for players and coaches. 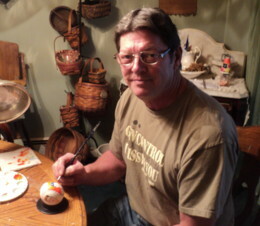 I personally design and paint all the artwork for each baseball. The balls are then reproduced so that your team can order as many as you like. 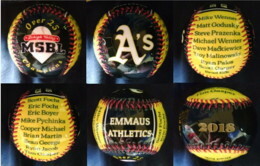 Here are a few examples of my MSBL Baseballs: Click on each link to see the details of each ball. 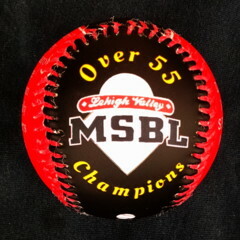 Coach Turk Staniri and his Moondogs of the over 55 division of the Lehigh Valley, Pennsylvania league, were division champs. I created this championship baseball just for them. Each member of the team received one. 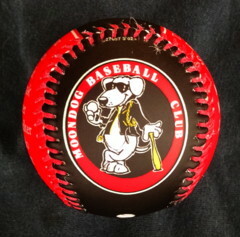 I created this baseball for the over 25 division Athletics. I did this baseball for my own Dodgers club in case we won, but unfortunately didn't win. 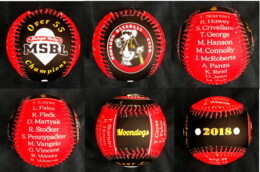 Each of these MSBL baseballs will have your painted MSBL League logo on the front along with your age division. The ball will be designed with your team's colors. The reverse side will have my hand painted logo for your club. Sides two and three will have the names of all the players on your roster. 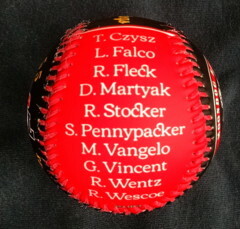 The top of the ball will have your team's name. The bottom of the ball will have the year you won the Championship! 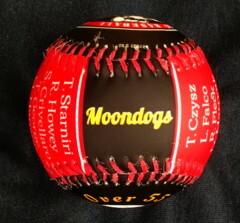 Each one of your team's baseballs will have a beautiful glossy finish and is safe to handle. Because of the time involved to paint all the artwork there is a 5 ball minimum order. I can't create just one baseball for 34.95. Most managers have been purchasing a ball for each player on their club out of their team's treasury. 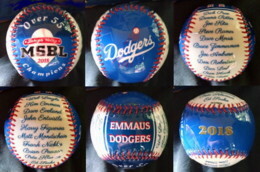 Each of these baseballs are priced at $34.95. The Shipping is FREE within the continental United States. Your baseballs will be shipped directly to you from the company that reproduces them for me. This is done so that I can offer Free Shipping. When I have the artwork finished for your baseballs I will email you and show you for approval. I can accept personal checks, money orders and Pay Pal. You can also use your credit card through Pay even if you don't have a Pay Pal account. If you would rather talk on the phone, contact me and I'll email you my phone number. We can set up a time to call.